At Feed a Billion, our goal is to alleviate hunger locally, nationally, and internationally. Some of you were there when I spoke to Tony Robbins, committing myself to provide one billion meals by November 20, 2020. At the time, I didn’t know what I was getting myself into. It’s been a wild journey, but I’m so glad I’ve taken it and every day we’ve taken one step at a time toward our goals. To date, we’ve provided close to two million meals to every corner of the globe! By forming strong food distribution networks in Kenya, the United States and India, we were able to obtain an average cost of 10 cents for each meal we provide. This allows us to stretch the value of each dollar we receive to achieve more efficiency. We’re incredibly proud of the brand we’ve built around Feed a Billion which resonates around the world. We are a registered 501c3 allowing for tax-deductible donations in the United States. We have low cost payment processing, a donor database, and have put hours of effort into planning and learning. 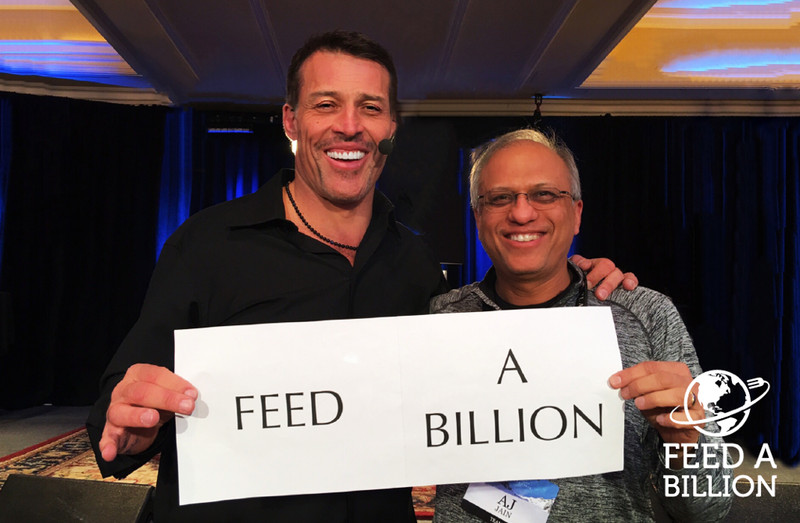 Feed A Billion has been featured in podcasts, web articles, news segments, and print media. All of which you can view on the media coverage page on our website. I have done quite a few speaking engagements as well through events like the Digital Footprint Conference and TedX Sugarland. If you haven’t seen those videos, be sure to check them out! And you can stay up-to-date by following us on our social media accounts. We have Facebook, Instagram, and Twitter. In addition to building the infrastructure needed as an organization, there has been the opportunity to innovate and to increase social media engagement for small and medium businesses using Facebook for cause marketing. You can reach around 1000 people for $20 through Facebook Ads. However, you will probably have about 5 people of that total number actually engaging (likes, shares, and comments) with your post. We have found that by tying businesses to the non-profit, engagement cost is significantly lower, so we have created a social media marketing platform that encourages engagement from the business’s audience. Some of the companies we have participating in that model can be found here on our leaderboard. There are some amazing sponsors on board supporting us so far. We know 1 billion meals is a big goal, but I know we can do it together! Our next goal is to raise $50,000 through the end of 2017 with our Fill the Plate Campaign. Will you stand with us in this fight against hunger?